We’ve partnered with Warner Bros. Home Entertainment for a giveaway of the brand new DVD release, Looney Tunes Rabbits Run. 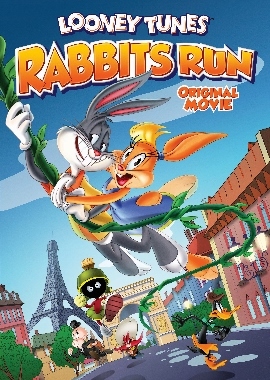 Available August 4 for purchase (visit the WB Shop), this DVD includes the all-new, original, full-length animated film Looney Tunes Rabbits Run. One lucky winner will receive this DVD compilation. To enter for a chance to win, answer the easy question in the Rafflecopter form below by August 14, 2015 (U.S. residents, 18+ only, no P.O. boxes). One lucky winner will be drawn at random and notified via email. The winner will have 48 hours to respond to our notification with their complete name and U.S. mailing address (no PO Boxes). Failure to respond within 48 hours will result in forfeiture and another winner will be selected. For complete giveaway rules, Giveaway Rules and Restrictions. Any cartoon with Bugs and Elmer Fudd! Yes, I love them! Bugs Bunny and Tweety Bird are my favorites! My favorite Looney Tunes movie is Looney Tunes: Back in Action! I still have my VHS copy! anything with bugs bunny in it! Yes, I do like them a lot. I love Looney Tunes, especially Wile E. Coyote and the Road Runner. I’ve always liked One Froggy Evening. Thanks for the giveaway. I hope that I win. I liked The Return of Looney Tunes – IFC. It was a very nice short.